Dremel Engraving Cutter, 3/32 in Diameter, 9-9/16 in Length, Ball Shape, 1/8 in Arbor/Shank, Carbon Steel, Silver, Applicable Materials: Wood, Fiberglass, Plastic and Soft Metals, 3/32 in Shank Diameter, Single Cut Tooth, For Engraving, Carving and Routing Used for sharpening chain saw blades, quickly and easily. Used for sharpening chain saw blades, quickly and easily. For No. 275, No. 285, and No. 395 Type 3, 4 and 5 Moto-Tools. Easily cuts off slots bolts, screws, sheet metal, thin wood and plastic, trim castings and molded ceramics. Cuts only along its edge. Do not attempt to sand or cut curved holes. Do not run in excess of 30,000 RPM. Use with No. 402 mandrel. Sanding Band covered with 60 grit aluminum oxide abrasive. Use for rough shaping, smoothing wood or fiberglass, removing rust from metal surfaces and shaping rubber surfaces. Bands are easily replaceable on drums. Do not use in excess of 30,000 RPM. A high quality industrial abrasive made for extended general purpose grinding on metals, castings, welded joints, rivets and rust or for working with conical surfaces. Do not run in excess of 30,000 RPM. Used for sharpening chain saw blades, quickly and easily. Great for light shaping and sanding. EZ Lock for faster accessory changes. Dremel Rotary Tool Bit, 5/16 in Diameter, 1/8 in Shank Diameter, HSS Cutting Edge, Applicable Materials: Wood, Plastic and Soft Metal, 25000 - 30000 rpm Maximum, Cylinder Shape, For Shaping, Hollowing, Grooving, Slotting, Inlaying and Making Tapered Holes Diamond wheel kit includes (2) 3/4" (19.05 mm) diamond wheels and (1) 1/8" Mandrel. For cutting metal, glass, ceramics and plastics. Max rpm: 30,000. High-speed cutter tipped with diamond particles tapered to a fine point for detail work. Used for engraving carving, finishing and other fine detail work on a variety of materials including wood, glass, ceramic and hardened steel. High-speed cutter tipped with diamond particles tapered to a bullet point for fine detail work. Used for engraving carving, finishing and other fine detail work on a variety of materials including wood, glass, ceramic and hardened steel. A wheel of abrasive strips on a 1/8" shank. As the flapwheel wears down, new abrasive is continuously exposed, preventing clogging and providing uniform finishing throughout the life of the flapwheel. Use to grind and polish flat or contoured surfaces including metal, wood, rubber and plastic. A wheel of abrasive strips on a 1/8" shank. As the flapwheel wears down, new abrasive is continuously exposed, preventing clogging and providing uniform finishing throughout the life of the flapwheel. Use to grind and polish flat or contoured surfaces including metal, wood, rubber and plastic. Fiberglass reinforced, use for slicing and cutting metal, wood and plastic. Do not attempt to sand or cut curved holes. Do not run in excess of 30,000 RPM. Use with No.402 mandrel. Shapes, smooths or grinds especially hard materials such as hardened steel, stainless steel, cast iron, nonferrous metals, fired ceramics, plastics and hard woods. Do not run in excess of 30,000 RPM. Shapes, smooths or grinds especially hard materials such as hardened steel, stainless steel, cast iron, nonferrous metals, fired ceramics, plastics and hard woods. Do not run in excess of 30,000 RPM. Dremel Rotary Tool Bit, 3/32 in Diameter, 1/8 in Shank Diameter, Tungsten Carbide Cutting Edge, Applicable Materials: Stainless Steel, Hard Steel, Cast Iron, Ceramics, Non-Ferrous Soft Metal and Plastic, 35000 rpm Maximum, For Shaping, Smoothening and Grinding For routing, inlaying and mortising in wood and other soft materials. Use with Dremel 230, 330 router attachments and 231 (678.2148) shaper/router table. Made of high-speed steel. Do not run in excess of 30,000 RPM. For routing, inlaying and mortising in wood and other soft materials. Use with Dremel 230, 330 router attachments and 231 (678.2148) shaper/router table. Made of high-speed steel. Do not run in excess of 30,000 RPM. Cuts a variety of ferrous and nonferrous materials. 3/4" cut depth. .05" wheel thickness. For use on SKU# 454.6933. High speed versatile, carving and engraving cutter. Made of high quality steel for use on wood, plastic and soft metals. Ideal for shaping, hollowing, grooving, slotting and inlaying. Appropriate for curved surfaces. Bit diameter: 3/16" (4.8mm). Used to attach a variety of plunger latches to window frame. Dremel Rotary Tool Bit, 1/4 in Diameter, 1/8 in Shank Diameter, HSS Cutting Edge, Applicable Materials: Wood, Plastic and Soft Metal, 25000 - 30000 rpm Maximum, For Shaping, Hollowing, Grooving, Slotting, Inlaying and Making Tapered Holes Bits are made of high speed steel and used for drilling into soft materials. Includes: 1/32", 3/64" bits (use #483 collet), 1/16" bit (use #482 collet), 5/64", 3/32" bits (use #481 collet) and 7/64", 1/8" bits (use #480 collet). One piece mandrel design simplifies the process of changing accessories and makes it easy to cut through a range of materials from metal to plastic. For use with exclusive EZ Lock Accessories. Allows you to quickly and easily change accessory bits on rotary tools 9.6V without changing collets. Accepts all accessory bits with 1/32" to 1/8" shanks. For cutting plastics. Compatible with all Dremel rotary tools. Pull-twist-release accessory changes. For use with the EZ402 EZ lock mandrel (SKU #482.4447). For routing, inlaying and mortising in wood and other soft materials. Use with Dremel 230, 330 router attachments and 231 (678.2148) shaper/router table. Made of high-speed steel. Cuts through metal. Pull-twist-release accessory change. Use with either EZ402 (SKU #482.4447). One piece mandrel design simplifies the process of changing cutting wheels and makes it easy to cut through metal. Cut off wheels labeled for easy identification. Compatible with all Dremel rotary tools . Designed to flush-grind a surface. Domed shape and extra-thick reinforced aluminum oxide material allows the grinding wheel to be used on either its side or face for surface grinding, shaping, smoothing, deburring, rust removal sharpening, and flush-grinding. Applications include extended general-purpose grinding on metals, castings, welded joints, rivets and rust. Use with either EZ402 (SKU #482.4447). Cuts a variety of materials such as wood, laminate flooring, drywall, PVC and plastic. 3/4" cut depth. .075" wheel thickness. For use on SKU# 454.6933. Includes 5 feed screws, hex key 3 set screws. For self-feed bits up to 2-9/16". High-speed cutter shapes ceramic wall tile around bathroom or kitchen fixtures or plumbing pipes or create decorative wall tile by cutting a design. Fast cutting, structured tooth-tape, for greater material removal on fiberglass, wood, plastic, epoxy, rubber, laminates, particleboard and ceramic tile. 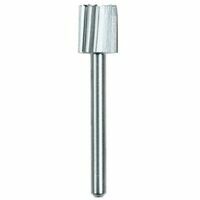 Solid carbide bit removes wall and floor grout 3/8" below the face surface. Compatible with 275, 285, 395, 381, 398, and 380. The EZ drum mandrel makes sanding band changes easy; just pull, place and secure. The one-piece mandrel design simplifies the process of changing bands and makes it easy to sand flat surfaces and edges. Provides a quicker and easier alternative to using a traditional sanding mandrel. Allows for flat sanding and edge sanding. Compatible with all Dremel rotary tools. Compatible with all Dremel 1/2" sanding bands. Bit diameter 12.7 mm. Universal system works on all rotary tools, including RTX and Wizard. Grinds, shapes and smooths most materials. Engraves most materials. Cuts nails, screws, bolts, chain, wire, pipe and closet maid shelving. Cuts most tiles and masonry materials such as wall tile, floor tile, porcelain, slate, stone and cement backer board. 3/4" cut depth. .075 wheel thickness. For use on SKU# 454.6933. Set contains: mandrel, (2) 1/2" felt polishing wheel, high-speed cutter, 1-1/4" fiberglass-reinforced cut-off wheel, aluminum oxide grinding stone, silicon carbide grinding stone, mandrel, nylon brush, (36) 409 15/16" emery cut-off wheel, 1/2" drum sander, 1/2" coarse sanding band, polishing compound, (2) 1/2" fine sanding band, (2) 1" felt polishing wheel and storage box. Applications: cutting, grinding, carving, engraving, shaping, sanding, cleaning and polishing..
20 piece set with assorted shapes and sizes of nickel bonded diamond points. 1/8" (3.18mm) shank. Excellent for deburring, etching and smoothing of glass, plastic, ceramics and metals. Max rpm: 30,000. For cutting metal. One-piece mandrel design simplifies process of changing cutting wheels, eliminates the need for screw and screwdriver. Effortless locking and loading, no tiny mandrel to lose. Compatible with all Dremel rotary tools. Includes No.EZ402 Mandrel and (5) No.EZ456 cutting wheels. Color code red. Do not run in excess of 35,000 RPM. Use to cut 1/2" wood and laminate. Pull-twist-release accessory change. For use with the EZ402 EZ lock mandrel (SKU #482.4447). Guides help restore edge on garden tools, sharpens all lawn mower blades and sharpens dull, slow-cutting chain saw blades. Includes garden tool, lawn mower and chain saw sharpening attachment, gauge, spacers, wrench, (4) sharpening stones and instruction manual. Fits tool models 4000, 3000, 400, 398, 395, 300, 285, 275, 200, 100, 8200, 800, 780, 770, and 7700. For use all dremel tools. Powerful shaping tool that quickly and efficiently removes material. Easily creates compound curves and works on a variety of materials including woods, fiberglass, laminates, plastic and leather.o.Cuts and finishes in one operation. Use the edge of the wheel for cutting and slotting. Use the "face" of the wheel for shaping. Cuts 33 percent deeper than former cutting/shaping wheels up to 1/2". DO NOT USE ON METAL Provides controlled cuts in a variety of materials. Depth adjustment sets correct cutting depth up to 3/4". Easy screw-on mounting and large window provides excellent visibility. Specs: fits tool models 400, 398, 395, 300, 285, 275, 200, 100, 800 and 780. Includes: multipurpose cutting guide attachment, (2) drywall cutting bits, (1) multi purpose cutting bit and instructions. High speed steel bit with single flute cutting edge for greater control through steps; hex shank prevents slipping in drill chuck. SpeedPoint tip penetrates faster and prevents walking in applications such as drilling holes into thin materials such as stainless steel, copper, brass, aluminum, plastic and laminates. Dual-flute design provides greater speed and control. Optimized for cordless drills in high speed. Rapid strike tip creates fast, accurate starts and generates less heat. Optimized geometry with black oxide coating to cut faster. Laser engraved reference marks easily stop on any hole size. 3 flat secure grip shanks reduce bit slippage in the chuck. Includes (3) 180, 280, & 320 grit abrasive buffs, (2) 36 & 120 grit detail abrasive wheels, (1) cloth polishing wheel and polishing compound. Sharpen lawn tools, remove rust, sand a sticker, engrave glass, plus more. Contains 31 genuine Dremel accessories for most every sanding, smoothing, shaping or grinding need. Includes a reusable storage box with removable organizer tray. Kerf: 0.05"; Blade thickness: 0.05"; Grit: 60, 120, 180 and 220. Color code: Blue. For use on glass, ceramic wall tile, glass block, glass bottles, and jewelry. For drilling in both flat and contoured surfaces. Diamond-impregnated cutting bit. Diamond grit around the circumference of the bit allows it to rasp a larger hole if needed. Holes on the side of the bit allow the removal of material. Includes cutting oil and instructions. High speed steel bit with single flute cutting edge for greater control through steps; hex shank prevents slipping in drill chuck. SpeedPoint tip penetrates faster and prevents walking in applications such as drilling holes into thin materials such as stainless steel, copper, brass, aluminum, plastic and laminates. Features a high-efficiency bronze core heating element that heats quickly with a maximum tip temperature of 1,050 degrees F for burning and soldering capabilities. Tool stand protects tool from marking work surface. Ergonomic, stay cool design for control and comfort and a short shaft length for control of tip. Specs: 110/120 V/AC, watts 30/W, weighs 2.5 ozs. Includes: multipurpose tool, tool stand, convenient tip storage tube, general purpose tip, script tip, cutting tip, hot knife tip, soldering tip. Cuts through metal. Pull-twist-release accessory change. Use with either EZ402 (SKU #482.4447). Use to cut through metal. Pull-twist-release accessory change. Compatible with all Dremel rotary tools. For use with the EZ402 EZ lock mandrel (SKU #482.4447). Self starting bit features single flute cutting edge for greater control through steps; three flatted shank prevents slipping in drill chuck. SpeedPoint tip penetrates faster and prevents walking in applications such as drilling holes into stainless steel, copper, brass, aluminum, plastic, laminates and other thin materials up to 1/8" thick. Includes (4) 1-1/2" metal-cutting wheels, (3) 1-1/2" thin-cut wheels and (3) 1-1/2" plastic cutting-wheels. Use with either EZ402 (SKU #482.4447). Coupling system allows you to rotate the attachment on your tool making hard to reach areas instantly accessible with the Right Angle Attachment. Specs: ball bearings and spiral bevel gears, quick connect system no tools required, compact, long-lasting and versatile. Fits tool models 400, 398, 395, 300, 285, 275, 800 and 780. Includes: right angle attachment and instructions. Versatile and reusable accessory kit includes everything you need to cut, grind, sand, polish, drill, sharpen and clean. Includes: 1-1/4" cut off wheel, 3/4" carbon steel brush, polishing compound, (4)-four-1" felt polishing wheel, silicon carbide grinding stone, high speed cutter, 1/2"/60 grit sanding drum with mandrel, 1/4"/60 grit sanding band with mandrel, mandrel, wrench, aluminum oxide grinding stone, silicon carbide grinding stone, aluminum oxide grinding stone, (12)-twelve-15/16" emery cut off wheel, (12)-twelve-15/16" heavy duty emery .-cut off wheel, 1-1/4" fiberglass reinforced cut off wheel, (4)-four-small felt wheel, cone polishing tip, (6)-six-1/2"/60 grit sanding band, (12)-twelve- 3/4" 180 grit sanding disc, (12)-twelve- 3/4"/220 grit sanding disc, (12)-twelve- 3/4"/.240 grit sanding disc, (6)-six-1/4"/60 grit sanding band, (6)-six-1/2"/120 grit sanding band, (6)-six- 1/4"/ 120 grit sanding band, mandrel, dressing stone, bristle brush and 180 grit abrasive buff. Use to cut drywall, wood, plastic, metal, cement, brick, and more. Includes (7) genuine Dremel Saw-Max cutting wheels: (1) SM500 wood and plastic carbide wheel, (1) SM540 tile diamond wheel, (2) SM520 masonry cut-off wheels and (3) SM510 metal cut-off wheels. Inside this accessory set are assorted bits for cutting, carving, engraving, grinding, drilling, sharpening, sanding, cleaning and polishing. The kit consists of regular cut off wheels, sanding bands, sandpaper discs, felt polishing wheels, carbon steel brush, aluminum oxide grinding stones, silicon carbide grinding stones, dressing stone, mandrels, wrench and a re-usable storage case. Removable and replaceable feed screw, cutting edges can be resharpened; 7/16" hex shank has flat surfaces for secure chuck grip. Used by electricians and plumbers in applications such as large hole drilling in wood. Includes: (2) two feed screws with each bit. Dual-flute design provides greater speed and control. Optimized for cordless drills in high speed. Rapid strike tip creates fast, accurate starts and generates less heat. Optimized geometry with black oxide coating to cut faster. Laser engraved reference marks easily stop on any hole size. 3 flat secure grip shanks reduce bit slippage in the chuck. High speed steel bit with single flute cutting edge for greater control through steps; hex shank prevents slipping in drill chuck. SpeedPoint tip penetrates faster and prevents walking in applications such as drilling holes into thin materials such as stainless steel, copper, brass, aluminum, plastic and laminates. Attaches to the rotary tool in seconds with Quick Connect System. Specs: makes clean, straight perpendicular cuts up to 1/4" thick, angled throat allows for straight, perpendicular cuts, clear housing for better visibility, directional guide and lower guard retracts when not in use. Includes: mini saw attachment, rip/crosscut blade, drive adapter and instruction manual. Two cutter design for maximum drilling efficiency and hole completion. Aggressive self-feed spur for faster drilling, 7/16" hex shank, shank flats for better retention. Two cutter design for maximum drilling efficiency and hole completion. Aggressive self-feed spur for faster drilling, 7/16" hex shank, shank flats for better retention. Two cutter design for maximum drilling efficiency and hole completion. Aggressive self-feed spur for faster drilling, 7/16" hex shank, shank flats for better retention. Removable and replaceable feed screw, cutting edges can be resharpened; 7/16" hex shank has flat surfaces for secure chuck grip. Used by electricians and plumbers in applications such as large hole drilling in wood. Includes: (2) two feed screws with each bit. Two cutter design for maximum drilling efficiency and hole completion. Aggressive self-feed spur for faster drilling, 7/16" hex shank, shank flats for better retention. Feed screws has a coarse thread for fast boring. Spurs on the outside diameter cut holes clearly and accurately; 7/16" Quick Change impact shank for use in applications such as large diameter holes in wood for pipe, conduit. Includes: Each bit is packaged with one hex key and two feed screws. Feed screws has a coarse thread for fast boring. Spurs on the outside diameter cut holes clearly and accurately; 7/16" Quick Change impact shank for use in applications such as large diameter holes in wood for pipe, conduit. Includes: Each bit is packaged with one hex key and two feed screws. Two cutter design for maximum drilling efficiency and hole completion. Aggressive self-feed spur for faster drilling, 7/16" hex shank, shank flats for better retention. Removable and replaceable feed screw, cutting edges can be resharpened; 7/16" hex shank has flat surfaces for secure chuck grip. Used by electricians and plumbers in applications such as large hole drilling in wood. Includes: (2) two feed screws with each bit. Comes with re-usable storage case and 160 accessories. Lift out trays for easy organization of the included bits. This kit is ready for cutting, grinding, polishing, sanding, cleaning and more. The kit also includes sanding bands, sandpaper discs, polishing compound, felt polishing wheels, aluminum oxide grinding stone, silicone carbide grinding stone, mandrels, wire brush and wrench. A complete start-up kit offering a breadth of accessories helpful for a wide assortment of tasks. 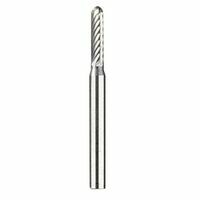 Hole enlarging features bit single flute cutting edge for greater control through steps and a a true round hole; 3 flatted shank prevents slipping in drill chuck. Used in applications such as drilling holes into thin stainless steel, copper, brass, aluminum, plastic and laminates; pilot hole required. Removable and replaceable feed screw, cutting edges can be resharpened; 7/16" hex shank has flat surfaces for secure chuck grip. Used by electricians and plumbers in applications such as large hole drilling in wood. Includes: (2) two feed screws with each bit. Feed screws has a coarse thread for fast boring. Spurs on the outside diameter cut holes clearly and accurately; 7/16" Quick Change impact shank for use in applications such as large diameter holes in wood for pipe, conduit. Includes: Each bit is packaged with one hex key and two feed screws. High speed steel bit with single flute cutting edge for greater control through steps; hex shank prevents slipping in drill chuck. SpeedPoint tip penetrates faster and prevents walking in applications such as drilling holes into thin materials such as stainless steel, copper, brass, aluminum, plastic and laminates. Two cutter design for maximum drilling efficiency and hole completion. Aggressive self-feed spur for faster drilling, 7/16" hex shank, shank flats for better retention. Jam-Free performance dual-flute design provides greater speed and control. Up to 2 times faster. Optimized for cordless drills in high speed. Rapid Strike tip creates fast, accurate starts and generates less heat. Optimized geometry with Black Oxide coating to cut faster and produce less heat. Up to 50 percent more holes per battery charge for greater user productivity. Laser engraved reference marks easily stop on any hole size. 3-Flat Secure Grip shanks reduce bit slippage in the chuck. Made in the USA. Two cutter design for maximum drilling efficiency and hole completion. Aggressive self-feed spur for faster drilling, 7/16" hex shank, shank flats for better retention. Feed screws has a coarse thread for fast boring. Spurs on the outside diameter cut holes clearly and accurately; 7/16" Quick Change impact shank for use in applications such as large diameter holes in wood for pipe, conduit. Includes: Each bit is packaged with one hex key and two feed screws. Feed screws has a coarse thread for fast boring. Spurs on the outside diameter cut holes clearly and accurately; 7/16" Quick Change impact shank for use in applications such as large diameter holes in wood for pipe, conduit. Includes: Each bit is packaged with one hex key and two feed screws. Removable and replaceable feed screw, cutting edges can be resharpened; 7/16" hex shank has flat surfaces for secure chuck grip. Used by electricians and plumbers in applications such as large hole drilling in wood. Includes: (2) two feed screws with each bit. Dual-flute design provides greater speed and control. Optimized for cordless drills in high speed. Rapid strike tip creates fast, accurate starts and generates less heat. Optimized geometry with black oxide coating to cut faster. Laser engraved reference marks easily stop on any hole size. 3 flat secure grip shanks reduce bit slippage in the chuck. Self starting bit features single flute cutting edge for greater control through steps; three flatted shank prevents slipping in drill chuck. SpeedPoint tip penetrates faster and prevents walking in applications such as drilling holes into stainless steel, copper, brass, aluminum, plastic, laminates and other thin materials up to 1/8" thick. Jam-Free performance dual-flute design provides greater speed and control. Up to 2 times faster. Optimized for cordless drills in high speed. Rapid Strike tip creates fast, accurate starts and generates less heat. Optimized geometry with Black Oxide coating to cut faster and produce less heat. Up to 50 percent more holes per battery charge for greater user productivity. Laser engraved reference marks easily stop on any hole size. 3-Flat Secure Grip shanks reduce bit slippage in the chuck. Made in the USA. Feed screws has a coarse thread for fast boring. Spurs on the outside diameter cut holes clearly and accurately; 7/16" Quick Change impact shank for use in applications such as large diameter holes in wood for pipe, conduit. Includes: Each bit is packaged with one hex key and two feed screws. Aggressive feed screw allows the bit to pull through the wood faster. Each bit comes standard with a second replacement blade made with hardened steel; size and model number engraved on each bit. Used by plumbers, HVAC contractors, electricians in applications such as drilling holes in all types of wood for pipe, vents, gas lines and bulk wire routing. Includes: 2-9/16" switchblade self-feed bit, (2) replaceable blades, (2) feed screws, (2) set screws, one (1) hex wrench. Drill press, tool holder and flex shaft holder all in one, drills accurate perpendicular and angled holes. Holds your tool in place for applications like sanding and buffing, and the telescoping flex shaft holder extends to any height between 16 and 29 inches. Specs: base 56 square inches, drill depth 2 inches, fits tool models 275, 285, 300, 395, 398, 400, 780 & 800. Includes: work station attachment, mounting wrench and instructions. Self starting bit features single flute cutting edge for greater control through steps; three flatted shank prevents slipping in drill chuck. SpeedPoint tip penetrates faster and prevents walking in applications such as drilling holes into stainless steel, copper, brass, aluminum, plastic, laminates and other thin materials up to 1/8" thick. High speed steel bit with single flute cutting edge for greater control through steps; hex shank prevents slipping in drill chuck. 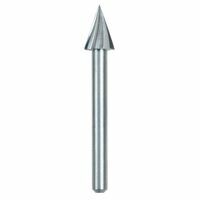 SpeedPoint tip penetrates faster and prevents walking in applications such as drilling holes into thin materials such as stainless steel, copper, brass, aluminum, plastic and laminates. Dual-flute design provides greater speed and control. Optimized for cordless drills in high speed. Rapid strike tip creates fast, accurate starts and generates less heat. Optimized geometry with black oxide coating to cut faster. Laser engraved reference marks easily stop on any hole size. 3 flat secure grip shanks reduce bit slippage in the chuck. Ideal for drilling true round holes with precise control in a variety of materials like sheet metal, metal plates, aluminum, fiberglass, plastics, plexiglass, and wood. The specially designed cutting edge drills true, round holes for a smooth, clean finish, and the SpeedPoint tip penetrates fast, prevents "walking," and eliminates the need for a pilot/starting hole. The hex shank provides a secure grip in the drill chuck. The permanent laser-etched sizes inside the flute are easy to read for precise control during the hole enlarging process. Includes sizes: 1/8" to 1/2", 3/16" to 1/2", 1/4" to 3/4" bits. High speed steel bit with single flute cutting edge for greater control through steps; hex shank prevents slipping in drill chuck. SpeedPoint tip penetrates faster and prevents walking in applications such as drilling holes into thin materials such as stainless steel, copper, brass, aluminum, plastic and laminates. Single cutting edge provides true round holes every time. High speed steel make-up is ideal for cutting into stainless steel, aluminum, brass, copper, plastic and more. Black Oxide finish resists corrosion for longer life. Speed start tip starts fast and reduces the risk of bit walking. Laser etched markings for fast, easy hole size identification. 3-Flat shank prevents bit from slipping in the chuck. Set included: (2) #4 Step Drill Bits, 3/16" -7/8" by 1/16". Includes a soft case to carry the set. Jam-Free performance dual-flute design provides greater speed and control. Up to 2 times faster. Optimized for cordless drills in high speed. Rapid Strike tip creates fast, accurate starts and generates less heat. Optimized geometry with Black Oxide coating to cut faster and produce less heat. Up to 50 percent more holes per battery charge for greater user productivity. Laser engraved reference marks easily stop on any hole size. 3-Flat Secure Grip shanks reduce bit slippage in the chuck. Made in the USA. Dual-flute design provides greater speed and control. Optimized for cordless drills in high speed. Rapid strike tip creates fast, accurate starts and generate less heat. Optimized geometry with black oxide coating to cut faster. More holes per battery charge for greater user productivity. Laser engraved reference marks easily stop on any hole size. 3 flat secure grip shanks reduces bit slippage in the chuck. Set includes: (1) #1 step drill bit 1/8"-1/2" by 1/32", (1) #2 step drill bit 3/16"-1/2" by 1/16", (1) #4 step drill bit 3/16"-7/8" by 1/16" and convenient carrying case to carry bits. Single cutting edge provides true round holes every time. High speed steel make-up is ideal for cutting into stainless steel, aluminum, brass, copper, plastic and more. Black Oxide finish resists corrosion for longer life. Speed start tip starts fast and reduces the risk of bit walking. Laser etched markings for fast, easy hole size identification. 3-Flat shank prevents bit from slipping in the chuck. Set included: (2) #9 Step Drill Bits, 7/8" & 1-1/8". Includes a soft case to carry the set. This chop saw for metal is a powerful tool to have with the strength and grit to get the job done. Goes from truck to jobsite and back without adding strain to your day. Designed with a large 11" x 18-1/2" base for dependability and stays tough to make jobs easier. The versatile "D" handle gives you comfort and control cut after cut. Portable and lightweight at only 34 lbs. Aluminum main table with Quick release rip fence, 0-45 degree and blade bevel. Table size 26" x 16". Max cutting depth at 90 degree = 3" ; Max cutting depth at 45 degree = 2-1/2". Accessories include: Spanner Wrench; Blade: 10" x5/8" x 24T; Rip Fence; 45 degree Miter Gauge; Push Stick. A quick set-up, quick release locking device holds material being cut securely during the cutting process. Material can be angle cut up to 45 degrees. Arm locks down for easy portability. Applications: fast cutting of drywall track in bundles, angle iron, conduit, pipe, channels, tubing, and rebar. Workpiece capacity: cutting pipe 5" O.D., bar stock 3-5/8", square stock 5". Specs:15 amp motor, 120 volts AC only. No load RPM 3900. 1" arbor. 9" maximum opening. Includes: vise, abrasive wheel and hex wrench. Rental. 15 amp motor. 4800 rpm. Extra large 24" x 20" die-cast aluminum table. Self-aligning rip fence automatically locks front and rear. Rips material up to 9-1/2" wide. Tool-free installation of blade guard and anti-kickback pawls. Oversized sliding miter gauge for miter cuts from 0-45 degrees. Bevel cut from 0-45 degrees. Rocker on/off switch. Optional sliding extension table expands rip capacity to 24". Includes: 40T Carbide-Tipped blade and heavy duty metal stand. Weighs 55 lbs. Powerful Hitachi motor, soft grip D-handle for easy operation and trigger switch with lock-off button and spark chute (diversion guard) for operators safety. Quick-locking vise for fast clamping. Spindle lock for easy wheel replacements. Double insulation. STANDARD EQUIPMENT: 1 cut-off wheel, 1 hex bar wrench. SPECIFICATIONS: 14" wheel diameter, 1" arbor. Capacity: 65mm (2-9/16") bar dia., 120mm (4-47/64") pipe dia., 130mm x 115mm (5-1/8" x 4-1/2") 235mm x 70mm (9-1/4" x 2-49/64") shape steel (W x H). 2,000W/AC 230V, 2,400/AC240V (15 AMP/AC120V power input (Full-Load Current for USA). 3,800/min no-load speed. 603 x 318 x 603mm. 36 lbs. tool weight. Quick-lock vise for fast material clamping. Ergonomically designed "D" handle provides comfortable hand position. Top handle allows saw to be easily moved. 45-degree pivoting fence allows for fast and accurate angle cuts. Spindle lock allows users to make wheel changes fast and easy saving time and money. Chain lock-down allows the head of the saw to be locked in the carrying position. Steel base allows users to weld jigs or stops directly onto the base. STANDARD EQUIPMENT: 14" abrasive wheel and wrench. SPECIFICATIONS: 15 amps, 3.2 H.P. No-load speed 3,800 RPM. 1" Arbor. WORKPIECE CAPACITY: Cutting capacity 4" round and 4" x 7-3/4" rectangular. Features heavy-duty folding stand for fast setup and easy transport, 3-1/2" cut height capacity cuts through 4x materials, self-aligning rip fence, miter gauge guides work pieces when making cross cuts, EZ view measurements system for accurate settings and on-tool storage for all accessories and guarding system. Die-cast aluminum table with 20in x 26in table surface extends to 20 in. x 32 in. for longer work pieces. Specs: 5/8" arbor size, neg 2-degrees to 47-degrees bevel angle range, 6' grounded cord length, 2-1/2" depth of cut at 45-degrees, 3-1/2" depth of cut at 90 degrees, 5,000 no load rpm and 120V. Includes heavy-duty folding stand, carbide-tooth blade, 2 blade wrenches, self aligning rip fence and miter gauge. Versatile and compact tabletop tile with high torque universal motor, high impact thermoplastic water reservoir, safeswitch prevents saw from being operated when locking key is removed. Specs: 120V, 5,500 RPM, blade capacity 7", arbor size 5/8", length of cut 12", depth of cut 2", LxWxH 17" x 14" x 12", weight 15 lbs. Includes: 7" wet cutting diamond blade, water pump, rip guide. Powerful 15.0 amp motor provides more overload capacity, increasing performance and durability. Quick-Change Blade Change System increases productivity by providing user ability to change wheels without a wrench. Quick-Fence tool-free, 45-degree adjustable fence for fast, accurate angle cuts and Quick-Lock vise for fast clamping on different size materials. Soft start extends gear and motor life. Ergonomically designed ``D" handle for more comfortable hand position reducing user fatigue. Extra wide solid steel base and heavy-duty lock down pin. Heavy-duty compression spring for smooth movement and greater durability. Spindle lock allows user to make quick wheel changes. Large cutting capacity, 5" round, 4-1/2" x 6-1/2" rectangle. Adjustable spark guard allows user to channel sparks. Easily accessible brushes for convenient servicing on worksite. STANDARD EQUIPMENT: 14" abrasive wheel, blade change wrench, blade bolt, blade washer. SPECIFICATIONS: 15.0 AC Amps, 5.5 HP, 1" arbor, 14" wheel diameter, 5" max. capacity (round), 4-1/2" x 6-1/2" max. capacity (rectangular), 4,000 RPM, spindle lock, quick lock vise. 21" tool length. 39 lb. tool weight. For cutting a variety of ceramic, porcelain, and stone tile, rigid steel frame, slip resistant feet, 7" continuous rim diamond cutting blade, large carrying handles, tilting table allows for miter cuts. Heavy-duty cast aluminum cutting table, drain plug makes for easy water change, adjustable rip guide mounts securely. Secs: Motor: 1 HP, 6.25 Amps. 3,600 RPM. Voltage: 120V/60hz. Blade size: 7". Blade arbor: 5/8". Table size: 18" x 22". Weight: 33lbs. Cutting capacity: Rip: Unlimited. Diagonal: Unlimited. Depth: 1-1/16". Use replacement blade 554.2840 10" table saw with folding leg stand. Powerful 15 amp motor. 4,800 rpm for heavy duty performance. Large cast aluminum table extends from 20" deep - 21 wide to 37" wide. Rip capacity 26" on the right side of the blade; 8-3/4" on the left side. Cut capacity 3" at 90? and 2" at 45?. Quick release rip fence adjusts easily and provides sturdy accurate cuts. Unique folding legs allow the user to easily transport the saw on the job. Wheels built in to the saw allow for easy transport using the right leg as a handle. Includes push stick, miter gauge, blade guard, rip fence blade wrench and 24th carbide blade. Weighs 55 lbs. Wet cutting tile saw. High torque, universal motor. Runs on standard house current and draws only 5 amps at 120 volts. Engineered for cutting ceramic, travertine and slate. MK Safe-switch prevents saw from being operated when locking key is removed. Chrome guide-bar and linear bearing assembly ensures accurate tracking and alignment. Single piece zinc-plated steel frame for rigidity, strength and durability. Hinged blade guard for easy blade changes. Fully submersible, thermally protected water pump. High impact removable thermoplastic water reservoir will not rust or bend out shape. 7" blade capacity. Includes 7" diamond blade, water pump, wrenches and rip guide. Depth of cut 2"; length of cut 18"; diagonally cuts 13" tile. Dimensions of saw: 33"L x 18-1/2"W x 12-5/8"H.
Use to cut marble, granite, porcelain, stone and tile. Dual internal water delivery system for maximum dispersion. Adjustable pivoting rail allows easy angle positioning from 90? to 45?. Angle/rip guide for consistent cuts. Automatic thermal overload protection prevents saw from overheating. Child-proof, locking on/off switch and key for safety. Power cords are encapsulated in a protective tube and attached to a flexible rod; keeps the cutting table safe and clear. Specs: motor: 1 HP, 120V-60Hz/9.5 Amps, 1100 watts, rpm: 3420 rpm, 8" blade capacity, 5/8" arbor, rip cuts 24" tile, diagonal cut on 18" tile, depth of cut: 1-3/8", dimensions: 37" L x 18" W x 47-1/2" H (w/legs), weight 82.32 lbs ( w/legs). Includes: transport handle and fold-out stand with wheels, 8" porcelain rated continuous rim wet diamond blade, high volume water pump and angle/rip cutting guide. This wood cutting portable Worm Drive Table Saw is specifically designed for ripping. With the power and torque to tackle difficult cuts, bogging down is a thing of the past. 3-1/2" depth of cut and 25" rip capacity are big enough to rip plywood sheets in half. It also features a Dual-Field motor and smooth start-up for a saw that runs cooler and lasts longer. Weighs 49 lbs. Maximized for accuracy, capacity and run-time. The brushless motor delivers the power to cut all common materials. 24" of rip capacity for ripping 4 x 8 plywood or OSB sheets. The rack and pinion fence allows for fast, easy adjustments. Power-loss reset prevents accidental re-starts following a power disruption when the tool is left in the "on" position. Site-Pro Modular Guarding system allows for tool free adjustments of the guarding. Metal roll cage base offers greater durability than plastic bases. Table coating reduces friction for smoother cutting. Table coating reduces friction for smoother cutting. 5/8" arbor size. 1-3/4" depth of cut at 45 degrees. Weighs 45 lbs. Includes table saw, carbide blade, non-thru cut riving knife, push stick, miter gauge, blade guard, rip fence and (2) blade wrenches. Compact 10" job site table say with Site-Pro modular guarding system. Rack and pinion telescoping fence rails make fence adjustments fast, smooth and accurate. 24" of rip capacity, easily cuts a variety of larger shelving and trim materials. Site-Pro modular guarding system allows for tool free adjustments of the guarding components appropriate for each application. 15 amp 4800 rpm motor quickly rips through hardwoods with ease. On board storage provides easy access to the Site-Pro guarding components and push stick when not in use. Metal roll cage base offers greater durability than plastic bases. Blade can be adjusted 0-45 degrees for bevel applications. Weighing only 48 lbs., the table saw can easily be moved on and off the job. Rear feet adjust to level the saw on uneven work surfaces. Dust port allows for 2-1/2" vacuum hook up and minimizes clean up. 24T carbide blade enhances cut quality and prolongs blade life. Table coating reduces friction for smoother cutting. Includes: Miter gauge, push stick, 10" carbide blade and blade guard. (DW7450 Stand sold separately Orgill sku 573.9974) This Dry Cut Saw for metal cutting has a 4-1/2" cutting capacity in a compact frame. Handles big jobs and moves easily from the shop to jobsite. Powerful 15 amp motor and no load 1500 rpm cuts faster and cleaner than a chop saw; no debarring needed. Soft-start for a motor that runs smoother and longer for more cuts. Includes a 12" dry cut saw and a Diablo Cermet-tipped 60-tooth blade. Weighs 38.2 lbs. The powerful 7.4 amp, high-torque motor has maintenance-free, self-lubricating pinion and gear-box assembly. Tilting head allows for precise 45 degree miter cuts and variable height cutting head allows for plunge cutting. Sliding aluminum die-cast cutting table rips 18" tile and diagonally cuts 13" tiles. Linear bearing and chrome plated guide-bar assembly ensure precise cutting. The frame is single piece zinc-plated steel for rigidity, strength and durability. Hinged blade guard allows for easy blade changes. Motor incorporates the heavy duty on/off MK-Safeswitch and a built-in water pump receptacle. Removable thermoplastic water reservoir, 7" diamond blade, submersible water pump and rip guide are all included. Weight 33 pounds. Dimensions: 33" long x 19" wide x 20" high. CSA approved. Laser indicator for consistent accuracy. Cuts 4x4 in one pass. Base of the saw incorporates a sturdy fold-down trolley stand with wheels, onboard accessory storage and can be rolled from one jobsite to another by using the outstretched leg as a pull handle. The stand also features an adjustable leg extension for set-up on uneven surfaces. Specs: no-load speed of 5000 rpm, overall table dimensions are 28-1/2"x19" with a 30" rip capacity to the right and 11" on the left, depth of cut is 3-9/16" at 90 degrees and 2-9/16" at 45 degrees, dado width is 1/2" and weighs 74 lbs. Includes: a rip fence, miter gauge, push stick, riving knife and sawdust collection bag. Saw features a large cast aluminum base for stability, externally accessible brushes, "tool-less" guide plate, D-shape handle for easy gripping, shavings collection tray, quick release vise and shaft lock for easy blade changes. Applications; cutting light pipe, angle iron, tubing and conduit. Specs: 1" arbor, max. cutting capacities at 90 degrees 4-1/2", at 45 degrees 3-1/2", 1,300 no load rpm, overall length is 20-1/4", weight 41.9 lbs. Includes: carbide tipped blade, socket wrench and switch button. This table saw is maximized for accuracy, capacity and run-time. The brushless motor delivers the power to cut all materials. Rack and pinion telescoping fence rails make fence adjustments smooth and accurate and provides the capacity to rip 4 x 8 sheet goods. Runs off of 20V/60V Flexvolt battery system for maximum portability. Power-loss reset prevents accidental re-starts following a power disruption when the switch is left in the "on" position. On board storage for guard, fence, wrenches and miter gauge. 24" of rip capacity for ripping 4 x 8 plywood or OSB sheets. Site-Pro modular guarding system allows for tool free adjustment of the guarding. Metal roll cage base offer greater durability than plastic bases. Table coating reduces friction for smoother cutting. Depth of cut at 45 degrees 1-3/4". Max width to left of blade 12". Tool weight 48 lbs. Includes: (1) 60 volt Max Table Saw, (1) Non-Thru Cut Riving Knife, (1) 20 volt/60 volt Max Flexvolt battery, (1) push stick, (1) Fast charger, (1) blade guard, (2) blade wrenches, (1) rip fence and (1) miter gauge. Rack and pinion telescoping fence rail make fence adjustments fast, smooth and accurate. Material support can be sued for narrow rip cuts. 28-1/2" of rip capacity easily cuts a variety of larger shelving and trim material. On board storage provides easy access to the blade guard assembly, fence, riving knife, push stick, miter gage, wrenches and cord wrap when not in use. Compact folding stand. Blade guard assembly allows for tool free adjustments of the guard for different applications. Flip over fence, allows for narrow rip cuts. Telescoping fence rails retract to create a small portable package. Features a 15.0 amp high torque motor with the power to cut pressure-treated lumber and hardwoods. 2-1/2" dust collection port easily connects to a vacuum for efficient dust extraction. 3-1/8" depth of cut at 90 and 2-1/4" at 45. No load speed 4800 rpm. 21-7/8" x 26-3/8" table provides ideal material support. Includes: 10" 24-tooth carbide blade, folding table saw stand, miter gauge, push stick, folding stand, rip fence, 2x blade wrenches and blade guard assembly. Jobsite table saw with folding rolling stand. Engineered for rip-sawing and cross-cutting or ordinary wood, hardwood, plywood and composite wood materials. Soft start function reduces noise and recoil at start-up. Electric brake halts rotation of brake within seconds. Overload protection automatically shuts off motor. Bevel range of 0 degree to 45 degree for cuts ranging from 3-1/8" to 2-1/4". Easy adjustments for blade height or angle. 2-1/2" rear dust port can connect to a shop vac or duct collection system. On-tool accessory storage. 15 amp motor. No load speed 4,500 rpm. 28-3/4" x 22" table extension. Telescoping table extension supports 35" of ripping capacity to the right and 22" to the left. Stable and durable fold and roll stand with large 8" rubber, all terrain treaded wheels. Includes 10" carbide tipped blade, blade guard assembly, anti-kickback pawl assembly, miter gauge assembly, push stick, rip fence assembly, outfeed support assembly, (2) blade wrenches, 5mm hex bar wrench, 4mm hex bar wrench, and 2.5mm hex bar wrench. REDLINK PLUS intelligence ensures maximum performance and protection from overload, overheating and over discharge. The M18 Red Lithium high output HD12.0 battery delivers unmatch run-time in all applications. The rack and pinion fence system maintains accuracy and allows for quick adjustments. On board storage for accessories. An all metal frame provides durability for daily jobsite use. Compatible with ONE-KEY, this is the industry?s first Table Saw that wirelessly connects to a smart phone to track and manage a tool?s performance and location. ONE-KEY, provides full visibility to how and where tools are being used across your network of jobs and users. The app will track all ONE-KEY compatible devices within 100' range of your phone. If your tool is lost or stolen, render it useless by sending a remote command to the tool to shut itself off the next time it comes within range of any ONE-KEY app. Specs: 6300 PRM, 8-1/4" blade size, 2-1/2" cut depth at 90 degrees, 1-3/4" cut depth at 45 degrees, 47 degrees max bevel, 5/8" arbor size, 41.6 lbs tool weight. Includes: (1) 18 volt M18 FUEL 8-1/4" Table Saw with One-Key, (1) N18 Red Lithium high output battery pack, M18 & M12 rapid charger, (1) anti kick back pawls, (1) blade, (1) blade wrench, (1) guard, (1) miter gauge and (1) riving kit. The Smart Guard System is the first ever quick and easy-to-use modular blade guard, anti-kickback pawls and riving knife system; provides superior control over the material and maximum visibility while cutting. Engineered for maximum trueness, the 'Squarelock' Rip Fence glides along the rail at a finger's touch or locks into place for solid and consistent cutting performance. Easy set up and take down of your table saw; heavy-duty construction and 8" pneumatic wheels allow the Gravity-Rise stand to handle the toughest jobsites. Integrated Sub-base increases tool life by handling jobsite abuse, while protecting the table saw's base. Built-in sub-base and tabletop carry handles add to the saw's portability from jobsite to jobsite. On tool storage for all saw attachments and tools. Soft Start and 'Constant Response' Circuitry for quiet and smoother start-up, reduced start-up torque and maintaining speed under load. Exclusive Arbor Lock for single wrench blade changes. INCLUDES: 10" Worksite Table Saw; 10" 40-Tooth Carbide Tip Saw Blade; Blade Wrench; Hex Key; Sliding Miter Gauge; 'Gravity-Rise'Table Saw Stand with Pneumatic Wheels; Smart Guard System. Jobsite table saw with rolling stand. Rack and pinion telescoping fence system make fence adjustments fast, smooth and accurate. Material support can be used for narrow rip cuts. 32-1/2" rip capacity easily cuts a variety of larger shelving and trim materials. On board storage system provides easy access to the blade guard assembly, fence, riving knife, miter gage, wrenches, push stick and cord wrap when not in use. Rolling stand designed for easy set up and breakdown with ideal stability. Telescoping fence rails retract to create a small portable package. Flip over ripping fence allows for narrow rip cuts. 15 amp motor quickly rips through hardwoods with ease. 2-1/2" dust collection port easily connects to a vacuum for efficient dust extraction. 3-1/8" depth of cut at 90 and 2-1/4" at 45. No load speed 4800 rpm. 21-7/8" x 26-3/8" table provides superior material support. Includes: 10" 24-tooth carbide blade, rolling stand, push stick, miter gauge, rip fence, 2x blade wrenches and blade guard assembly. Integrated cantilevering rail/cart system allows for 24" ripping capacity, 18" tile on diagonal, stainless steel rail system is integrated into the saw frame, integrated 45/22.5 degree miter feature for quick angled cuts, plunge feature, adjustable dual water nozzles, rear and side water attachments help contain water run-off and blade spray, removable cutting cart for easy cleaning, 5 gallon water pan, edge guide with 2-position,45/90, degree guide, will cut hard materials such as porcelain and stone. Specs: 15.0Amps, blade diameter 10", max rip capacity 24" tile, diagonal cut capacity 18" tile, max depth of cut 3-1/8", pan material, ABS plastic, removable water containment tray, 34"Lx26"W(housing only), weight 69 lbs.